All are for Windows (some have Linux versions too), all are free, and most are Open Source. This is the new C++ IDE from JetBrains, currently available on an early access program. I’ve used it for various small projects and have come to the conclusion that its not ready for prime-time yet, but is definitely one to watch. As with CodeBlocks(see below) it works with the GCC C++ compiler and the GDB debugger. CodeBlocks (I’m omitting the double colon because Live Writer seems to want to treat it as as a smiley) is the IDE I use to develop most of my C++ programs, using GCC (it also works for C and Fortran), where the size of the project is more than a couple of files. It’s compact, it’s fast, it’s cross-platform, and it does most of what I want a C++ IDE to do. Code completion when it works properly is very good – when it doesn’t (which seems a bit random), it isn’t. The debugger (which is a front-end for GDB) has improved recently. A viewer for debug messages produced by calling the Windows OutputDebugString API. More information in another blog article of mine is here. Dependency Walker is a program that allows you to look inside a Windows executable or DLL and see which other DLLs it is dependent on. This is handy for resolving runtime dependency errors and for checking that you are not distributing executable code without also distributing required DLLs. Racket is a Scheme dialect and is my go-to language when I feel like doing a little functional programming. Dr Racket is the IDE for the language and comes with all you need to get started, including a lot of documentation and tutorials. I recommend Racket if you want to get into FP, but find Haskell a bit intimidating. This is IntellijIDEA, which is JetBrains’ Java development IDE. If you write any Java code and are still using the ghastly Eclipse or NetBeans IDEs, you really should take a look at this. I use the free Community Edition, as I don’t really do enough Java these days to justify the more capable paid-for version. A vastly improved shell for Python. If you do any Python programming at all you really should get hold of this. It also works well with the PyCharm IDE described below. This is actually the TortoiseHg workbench for the Mercurial version control system. It’s my favourite IDE for working with a VCS, but I must admit I still do a lot of VCS stuff from the command line. Like Scheme, Smalltalk is one of those languages I play with once in a while, and Pharo is probably the best Smalltalk implementation available. It’s a fork of the Squeak Smalltalk project, which removes a lot of the cruft that project has accumulated over the years. Yet another product from JetBrains, this is their Python IDE. If you are still using the very horrible IDLE that comes with Python, you should get PyCharm immediately and see what a real Python development environment should look like. Once again, I use the free Community Edition. ResEdit is a free resource editor for use when writingWin32 API programs. Itallows you to create resources such as dialogs, menus, string tables etc.which can then be linked into your Windows applications via a resource compiler. This is a simple IDE for the R programming language, which is aimed at people that want to do statistical analysis. I mostly use it for drawing graphs. There are numerous IDEs for working with MS SQL Server (including the one that comes with SQL Server), but this one is probably my favourite third-party product. I use the freeware version. SourceTree is a free GUI client for the Mercurial and Git version control systems. It’s produced by Atlassian, the people behind Bitbucket (which I recommend for your DVCS hosting). As I said when discussing Mercurial, I prefer TortoiseHg when using that VCS, and I use SourceTree (and the command line a lot) when working with Git. This is SQLite Expert, a GUI for working with the SQLite database engine. It’s a handy tool for writing quick tests of SQL syntax when you can’t be bothered running something more heavyweight. This is a shortcut I use to start the Microsoft SQL Server Express database server (there’s a matching “stop” shortcut). SQL Server is probably the best SQL database system available on Windows, and is certainly the best documented. The Express edition is free to use. Twine is a tool for writing Interactive Fiction, something I dabble with from time to time. Of all the IF tools out there, I’ve found Twine the simplest and most fun to use. A new browser-based version (2.0) has just been released. This is of course Microsoft Visual Studio. I use this when writing C# code, but not for C++ (it’s a brilliant C# IDE), as I really don’t like the hoops you have to jump through to do some of the simplest things with that language. Please note that if, like me, you are interested in writing classic Windows desktop applications, you want the “for Windows Desktop” version. 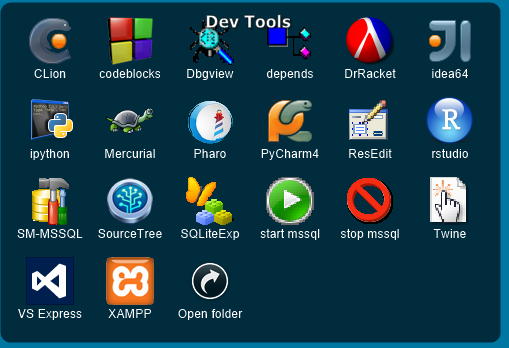 Last but not least, we have XAMPP, which provides a PHP web development environment (PHP, Apache, MySQL) on Windows. I don’t do much Web stuff any more, but this is probably the simplest single-package way to work with PHP on Windows. Well, that about wraps it up. As I said, I do use numerous other development tools, mostly from the command line, but detailing them will have to await another article. In the previous article on this subject (which you should read first) I looked at how to go about creating a simple generic makefile for a C++ project which allowed you to add source files to the project without modifying the makefile, and which generated dependency information for you automatically. In this article I look at expanding this makefile to work with multiple directories. Makefile sources, and example C++ projects, can be found here, in the srcinc subdirectory. The srcinc directory is the project root (in a real project I would probably give it the same name as the executable) and contains the makefile that builds the project. The bin directory contains the final executable program the compiler (controlled by the makefile) produces.. The source files are placed in the src directory, and the headers they #include are placed in inc. The compile-produced intermediate .o and .d files are created by the compiler in the obj directory. From the compiler’s point of view, there’s nothing magical about any of these names – you could call them whatever you like. As I said earlier, these names are not significant to the compiler, and can be changed to your own personal preferences. except that the generated filenames are preceded by directories in which we are going to locate the files – the C++ .cpp sources going in the src directory, and the compiler-generated .o and .d files in the obj directory. This says that the .o files in the obj directory are dependent on the .cpp files in the src directory, and specifies how to use the C++ compiler to build them. There are a couple of things to note here – the backslashes are used to escape end-of-lines in the rule so that the compiler/sed invocation is seen by the shell as being all on one line. The ‘%’ characters are used as delimiters in the sed search-and-replace expressions because forward-slashes, which you would normally use, are needed to specify the directory paths. and we are done! You can now add .cpp files to the src directory, and headers to inc, and running make will automatically pick them up and build the object files and executable for you. This article has demonstrated how to use a makefile in a project which has been split up into sub-directories. In a future article I’ll demonstrate how to modify this makefile to build debug and release versions of the product. This article looks at the dependency generation feature of the GCC compiler and its use with GNU Make to create generic makefiles which do not require maintenance as a project grows. Sample makefiles and C++ projects using them are provided on Bitbucket. The projects were created and tested using TDM GCC and MSYS on Windows, but should also work on Linux. You will need to have some familiarity of the C and C++ separate compilation model in order to fully understand the article – I have a few articles on this beginning here. Here, I’m going to give a brief introduction to the GNU Make utility. You are strongly advised to also read the excellent documentation for GNU Make. Make is a program for building things from separate components. The things built are often executable programs, but they don’t have to be. For example, at a training company I used to work for we used Make to construct our courseware documentation from typesetting instructions in troff files, images, program code and various other sources. where “to-build-this” is the name of the component we are trying to build (such as an executable, a library, or an object code file) and “from-these” is a list of files from which the component will be built (in a C or C++ project these would be source and header files); the component we are trying to build is said to be dependent on these files- if any of them change the component needs to be re-built. Handling these dependencies is the basic task that Make performs for us. The component name and the dependency list are separated by a colon. The third element of a Make rule is the command that will be used to make the component. This command must be indented from the other elements using a TAB character (using spaces will result in strange error messages from Make) and will usually be something like a compiler or linker command line. You can actually specify any number of commands – all must be indented using tabs. The command is invoked if any dependent file has a modification date later than that of the component being built, or if the component does not exist. which says that the executable called myprog.exe is dependent on the source files main.cpp and utils.cpp, and the header file utils.h – if any of these files change, then make should rebuild the executable using the supplied g++ command line.With that rule in place in a makefile, we can build myprog.exe simply by typing make at the command line prompt. Unfortunately, although manually editing the makefile is do-able for small projects, as the project increases in size this becomes harder and harder, as source files include headers, which include other headers, and so on. It would be nice to have a utility which looked up the #include directives that cause the dependencies for us, and in fact there is such a tool – the GNU GCC compiler collection. The use of the –MM option tells GCC to read the input source files and extract the dependency information from the #include directives. The dependency information is then written to standard output. Notice there is no command specified, only dependency information. When make sees lines like this, it then knows what a product is dependent on, but doesn’t know how to build the product from the dependencies. The CXX and LINKER variables say which C++ compiler and linker to use – in this simple example we will use the g++ driver program to perform both tasks. The INCDIRS variable will be used to say where the compiler should look for #included header files (the current directory, in this case), and CXXFLAGS specifies some standard C++ compiler options. we use the patsubst (it stands for “pattern substitution” – a bit like the sed command) function to generate a list of object files from the list of source files we just created by replacing all .cpp suffixes with .o. The last list of files we need is one containing the names of files that will contain the dependency information we are going to create using the –MM option of GCC, as described in the previous section. One such file will be generated for each .cpp file. and will be invoked if either of main.o or dice.o is newer than rollem.exe, or if rollem.exe does not exist. which says that main.o is dependent on main.cpp, dice.h and report.h. A similar .d file is generated for the dice.cpp source file. which should pull in the .d files, much like #include works in a C or C++ program. However, this isn’t exactly what happens. If the .d files already exist, then they are simply included in the makefile, and Make reads the dependency information from them. However, if they don’t exist (as they won’t the first time Make is run using this makefile) Make will look to see if there is a rule to create them. There is (the last rule) so Make runs the command associated with that rule to create the .d files and then re-reads the whole makefile. This time the .d files do exist (because we just created them), so they are read by the simple include mechanism. You can see that the dependency information files are generated, then the .cpp files are compiled to .o files, and finally the .o files are linked to create the executable. Notice that none of the names of the .d, or .cpp files are explicitly mentioned in the makefile. make: `rollem.exe' is up to date. Make has to re-build both the dice.d dependency file, the dice.o file and the executable. However, it does not rebuild main.d or main.o. Both of the .cpp files need to be re-compiled as both contain #includes referencing the dice.h header file. However, the dependency files are not re-built, and this is a problem, which I address below. The new .cpp is recognised, dependency information is generated, and the file is correctly compiled and linked, all without the makefile needing to be changed in any way. and the same for the dice. * files. which uses sed to edit the dependency to begin with whatever %.d actually is when the makefile is run, which will be the name of the .d file we are generating. With this rule in place, whenever we add a dependency to existing dependencies, the .d file files will be automatically updated with the new dependency information when we run Make. This article has presented a simple generic makefile which can be used to build multi-file C++ projects, with dependency information being provided by the GCC compiler rather than being hard-coded (possibly incorrectly) in the makefile by the developer. In a future article I’ll look at how this makefile can be expanded to work with multi-directory projects and with debug and release builds of the product(s) being developed. In this article I’ll be looking at the “undefined reference” error message (or “unresolved external symbol, for Visual C++ users). This is not actually a message from the compiler, but is emitted by the linker, so the first thing to do is to understand what the linker is, and what it does. To understand the linker, you have to understand how C++ programs are built. For all but the very simplest programs, the program is composed of multiple C++ source files (also known as “translation units”). These are compiled separately, using the C++ compiler, to produce object code files (files with a .o or a .obj extension) which contain machine code. Each object code file knows nothing about the others, so if you call a function from one object file that exists in another, the compiler cannot provide the address of the called function. This is where the the linker comes in. Once all the object files have been produced, the linker looks at them and works out what the final addresses of functions in the executable will be. It then patches up the addresses the compiler could not provide. It does the same for any libraries (.a and .lib files) you may be using. And finally it writes the executable file out to disk. The linker is normally a separate program from the compiler (for example, the GCC linker is called ld) but will normally be called for you when you use your compiler suite’s driver program (so the GCC driver g++ will call ld for you). Traditionally, linker technology has lagged behind compilers, mostly because it’s generally more fun to build a compiler than to build a linker. And linkers do not necessarily have access to the source code for the object files they are linking. Put together, you get a situation where linker errors, and the reasons for them, can be cryptic in the extreme. Put simply, the “undefined reference” error means you have a reference (nothing to do with the C++ reference type) to a name (function, variable, constant etc.) in your program that the linker cannot find a definition for when it looks through all the object files and libraries that make up your project. There are any number of reasons why it can’t find the definition – we’ll look at the commonest ones now. then we would still get an error from the linker because the signatures (name, plus parameter list types) of the declaration and definition don’t match, so the definition actually defines a completely different function from the one in the declaration. To avoid this problem, take some care when writing declarations and definitions, and remember that things like references, pointers and const all count towards making a function signature unique. For further information on compiling and linking multiple files in C++, particularly with GCC, please see my series of three blog articles starting here. The linker error regarding WinMain above can occur in a number of situations, particularly when you are using a C++ IDE such as CodeBlocks or Visual Studio. These IDEs offer you a number of project types such as “Windows Application” and “Console Application”. If you want to write a program that has a int main() function in it, always make sure that you choose “Console Application”, otherwise the IDE may configure the linker to expect to find a WinMain() function instead. To understand this issue, remember that a header file (.h) is not a library. The linker neither knows nor cares about header files – it cares about .a and .lib files. So if you get a linker error regarding a name that is in a library you are using, it is almost certainly because you have not linked with that library. To perform the linkage, if you are using an IDE you can normally simply add the library to your project, if using the command line, once again please see my series of blog articles on the GCC command line starting here, which describes some other linker issues you may have. The unresolved reference error can have many causes, far from all of which have been described here. But it’s not magic – like all errors it means that you have done something wrong, in you code and/or your project’s configuration, and you need to take some time to sit down, think logically, and figure out what. Over the years, I’ve done my share (more, it has often seemed) of interviewing candidates for C++ programming posts. During this time I’ve zeroed in on a small subset of questions I ask candidates. These have no correct answers, do not refer to manhole covers, and require no maths ability to answer. They have, however, proved effective in deciding if the candidate actually has some knowledge of C++. I present them for your delectation. This is my start-off question. If people look blank when I ask it (and depressingly, lots do), then I write out the signature of the constructor for them. If they still look blank, the interview terminates – this has saved me a lot of time over the years. What I’m looking for here is someone that knows how important copying is in C++, where it takes place, and how it can be avoided. I’d expect a decent C++ programmer to be able to talk for around 15 minutes on this, with me asking subsidiary questions. C++ is a very complex language, and to learn it thoroughly you simply have to read several good books – internet resources will not be enough. I don’t particularly care which books the candidate talks about, providing there is more than one of them, and they can come up with some convincing reasons for liking them. The file bible.txt, which is provided, contains the text of the King James Bible. Your program should read this file and output the 10 most frequently occurring words, together with their frequency, ignoring any punctuation and character case. Use the style of coding, commenting etc. that you would for a large program. As with the other questions here, I’m not particularly interested in the details of the solution, provided they show a knowledge of Standard Library classes like strings and maps, and that the program actually works. Or similar – if the candidate has professed a knowledge of a library like Boost, I might ask about that instead. Once again, I don’t particularly care what the candidate thinks are important, only that they can talk about them articulately and knowledgably. This one is down to a guy I worked with at the now defunct Lehman Brothers (thank you, Mr James). He interviewed me, and after a couple of questions said, “Well, you obviously know a lot more about C++ than I do, so tell me, if you were interviewing me, what questions would you ask?” I thought that was brilliant at the time, and still do – use it if you are interviewing a self-styled guru. Of course, you have to ask them why they would ask that question! From the above, I think you can see that you do not have to ask candidates trick questions, or puzzles about manhole covers. Instead, you should be trying to get them to talk at length about their knowledge of the C++language and how it can and should be used. Lazarus: Risen From The Grave?